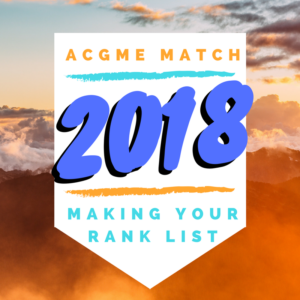 It’s that time of year again, when fourth year MD and DO medical students agonize over finalizing a Rank List to submit for the ACGME Match. This year’s due date is 2100 on 2/21, less than three weeks away, and I know you’re in a state of panic. It doesn’t help that you have to wait nearly a month for Match Week; and if you’re a DO who dual-applied, you may get to do this twice! Take a deep breath and relax. FMS is here to help. What happens if I don’t Match? You enter the SOAP (more details in our older post). Unless you’re a DO, in which case you enter the Scramble. How does the Match even work? Via the Match algorithm, of course. People matter. If you really clicked with the attendings and residents you met at a program give that a lot of weight. Don’t consider your fellow interviewees, although it can be easy to conflate the two. These are your future mentors, teachers and friends – they shouldn’t be merely people you tolerate, but individuals you want to spend time with away from work. Pick your passion. If there’s a population you’re really passionate about, pick the place that you know serves that group. On a tough day in clinic getting to do more of what you love makes your world a better place, and that can make you a better doctor. Consider your family. Whether you’re raising one or considering returning to your home state this matters so much more than we realize. I wouldn’t have survived intern year without having the joy of spending my vacations two hours drive or an hour flight from my close family. And I’ve recently met residents who’ve literally flown cross-country to spend a mere twelve hours with family, because that’s the best they could do on their schedule. ← Match 2019: ACGME and the Last of the AOA Edition?